Went for my Tuesday night four mile run and thought about how honored I am to be in the mix with two of the most amazing women runners in the rankings. Hats off to the amazing Barbara Robbin and Scarlett Gilbert... true inspirations! I will miss the awards Friday (commitment with my college daughter) but will acknowledge their achievements here--Congrats, age has no limits! Sharlett and Barbara had an amazing year but so did you finishing third for the year. BIG congrats to you three and Kat just behind. I ran with the Mid Pacific Road Runners Club on a 4 mile loop through Ala Moana Beach Park for their Friday Night Fireworks Run. After... there was a pot luck, beach chairs and watching fireworks, provided by Hilto Hawaiian Village. While on vacation... I ran 4 miles with the Honolulu Marathon Clinic. They meet most Sundays in a park near Waikiki. Ran 6.25 at a faster than normal pace on dreadmill. Ran a very hot 5.5 miles with local running club. Ran 3 miles to track, 2.5 miles intervals, 3 miles home. Ran 16 miles into Boston for a donut. Ran 2 miles to track, intervals, 3 miles home. Weights, ran 2 miles, 1 hour spin, ran 1 mile. Did an additional 2 miles this evening. 3.11 miles in 30:00 on the neighborhood streets, then 9.15 miles in 30 minutes on the recumbent bike. My calf injury seems to be behind me at this time. Got in some good runs over the weekend in Bend Oregon. Wow, what a great place to run. My son lives up there now and I can't wait to get back up there. I love Oregon... graduated from Grants Pass High in Southern Oregon. Skied Mt Bachelor in Bend. Perfect powder! Bend is an amazing place to run. Running along the river and canals really was nice. 3 Easy miles in Ithaca, NY. Club workout with 2 miles running, spin, weights. Ran my annual tribute to the Boston Marathon by running 27.50 miles on the course. Started with some friends around 8 PM in Wellesley with some friends, ran to the finish line and back out. Finally got home around 3 AM. Intervals Warm up for 1.75mi Intervals - 1x1mi 2x0.5mi Cool down - 0.25mi Still tight LCL but pain much less. First time could run...slowly ramping. Need to gain some aerobic fitness for Boston (may need to run walk it). Ran 2 miles, 1 hour spin, weights, ran 1 mile. Ran my 25th straight Carlsbad 5000 on Sunday. Wanted to run 35 seconds faster but with the lack of training and up a few pounds it just did not happen. But I did finish 4th in my division. Top three get a special award. I have gotten 4th here at least ten times and just one third over the years. Fun event. Congrats Bob! Carlsbad 5000 is on my BUCKET LIST. I think I want to do the All Day 20K. 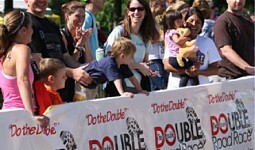 Dwayne you would do in the all Day 10K, it is kind of like our Double but it is a Double Double. Good event. Went to Virginia Beach, Virginia to run the National Master's 8KM Championships last Saturday but was knocked down at the start and fractured my left hip. In the hospital for 4 days. Now home rehabbing. Freak accidents do happen. I am so sorry this happen and I am glad to know you are getting better. You will bounce back stronger than ever. We are sending you positive thoughts! Easy Warm up then run up Winchester Hills to Lark. Pushed hills, then finish with 2x0.25mi. Started off very sore for 2 miles. Leaving Friday morning to run my 25th straight Carlsbad5000. Have had to deal with some issues which has impacted my training BUT I hope I can still get under 24 minutes. This will be my second race in the 70 plus age group. Long Run Longest run in 3 months...over-dressed with sweats, jacket, hat, gloves...shed them all over 10 miles. Miles 16-18 were hardest. Had 1 GU, 2 magic beans, and one caffeine pill, as my legs were dragging with sore upper hamstring/glutes. Finished with 2 faster miles. Ran 21 miles, mainly along the marathon route and ended up at Kanes Donuts. Easy Hills of Winchester Perfect morning with lull in rain. Focus on form with Newtons. Long run Longest run in over 5 weeks. Kept pace in very comfortable range to get time on legs and see how body feels at end... hamstrings start aching...caffeinated GU helped for last 5 miles. Did a two mile run without much pain. One way or another I am running our Palo Alto Double 8k on Sunday. Might be slow. Will be my first race in the 70 plus age-group. See you there. Remember about Daylight Saving Time. Warm up - very stiff in hamstrings....after 5 miles started to push limit of where pain begins to increase (not sharp/good pain). Focus on relaxing and good form. Shorter stride and neutral landing feels better. Last two miles felt good. Intervals Warm up for 1.25 Intervals - 1x1mi 2x0.75 3x0.5mi Cool down - 0.25mi cold...hamstrings still tight.....getting better, able to go faster - 90%. Try Bikram Yoga, Bob! I have resolved my Sciatica, since doing it for several months. You can try a free class with me some Saturday. Sciatic pain is horrible. I have it most of the time. Resolution depends on what is causing it. Motrin works fairly well. I wish you the best. I need to get this under control. Been over six weeks now...good ideas! Medium effort cold run with sweats, hat, gloves, long sleeve, and jacket. Starting slow and finished fast. ran 1 miles, 1 hour spin, ran 1 mile home. Intervals - freezing cold. Tights, gloves, beanie, jacket, long sleeve..... Warm up for 1.25 miles Intervals - 4x1 mile at half marathon pace Still tight in upper hamstrings....90% healed...need 10 seconds per lap...getting there. BUT I am still getting in my 20 plus miles per week. Just a lot of it is walking...but that is okay for right now. Recovering with yoga and short run today. Hamstring on the mend. Still need miles for Napa Marathon coming up. Moderate training run, just under 9 min pace, nice weather today (for Feb). First mile mostly 9-15% incline. Recovery Have strained hamstring from half on Sunday. Took it easy jog for 1/4 mile jogging then stretch. Did 8 of these until pain was dull ache. Felt better on last lap with slight pain. Our next Double Racing Event is coming up March 11 in Palo Alto. Double 8K...Hope you can join us! Easy Taper Finish with 4x0.25mi...feeling rested for half on Sunday. Ran 6 miles on treadmill. Easy Taper Kept heart rate low...focus on form with Newton's. Easy shake out run after yoga and core. Used new Boston Addidas - light and cushioned boost foam. Sunnyvale, Alviso and Coyote trails. Long Run Kept fast pace throughout for sub 8 per mile long run. Felt good at end. Easy Endurance Fatiguing legs for tomorrow's long run. Easy Form Run Focus on hips forward with lean...used Newton to do midfoot strike. Finished with 4x0.25mi with jog between strides. Yoga first with core, then easy run. Long Run Warm up for 2 miles Tempo for 2 miles at half marathon (6:40's) Long Hills with SVMC for 16.3 miles in Aldercroft along Alma Road Very cold with numb fingers & ears. Easy Hills of Winchester and Vasona Focus on cadence at 180 with beeping from Garmin. ran 3 miles, 1 hour spin ran 1 mile home. Have been getting in 20 plus miles a week for the last seven weeks. I hope to keep it to 20 as my minimum. Want to be ready to run my first Double in the 70 plus age group. Palo Alto March 11 Double 8K.